Dylan Meyer takes a practice swing at the Demirjian Golf Practice Facility on April 6. Junior Dylan Meyer continues to rack up awards. Coming off of his third consecutive title of the season and earning the Big Ten individual championship, Meyer was named the Big Ten Player of the Year. Looking back to his freshman year, Meyer had a 73.08 stroke average and has since brought it down to 70.83. 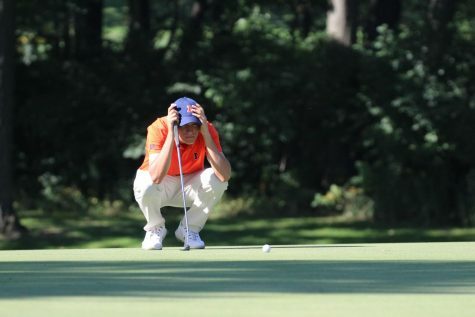 During that time, he snagged his first college win at the Fighting Illini Invitational as well, placing in the top-25 in the national tournament. After golfing all that summer, Meyer came back to defeat the NCAA individual champion Aaron Wise in the Match Play Semifinal along with finishing in the top-20 in the NCAA national championship again. Meyer ended last season with a 72.25 stroke average. The Evansville, Indiana, native won the Big Ten tournament over the weekend, shooting 1-under par in the last round to finish at 5-under for the event. 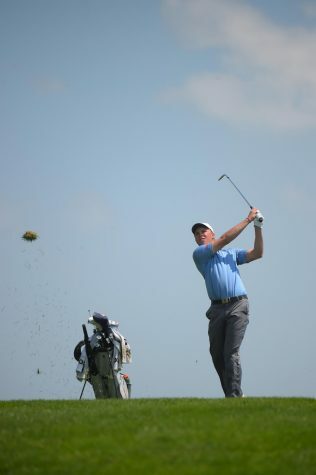 In the first round of play, Meyer tied an Illinois-best score of 63, which Chris DeForest set in 2007. The score also set a Big Ten tournament record and course record for lowest single-round total. On Wednesday, Meyer was announced as a finalist for the Ben Hogan Award. He will attend a banquet on May 22 at Colonial Country Club in Fort Worth, Texas, where the winner will be announced. The junior, along with Hardy, was also named a semifinalist for the 2017 Division I Jack Nicklaus National Player of the Year Award. The top player from all levels — Division I, II, III, NAIA and NJCAA — is selected for the Hogan Award. The top player from each level is chosen for the Jack Nicklaus National Player of the Year Award. The Hogan Award examines play in college as well as amateur competitions. The finalists for the Hogan Award will be announced Wednesday and the Nicklaus National Player of the Year Award finalists will be announced June 1. 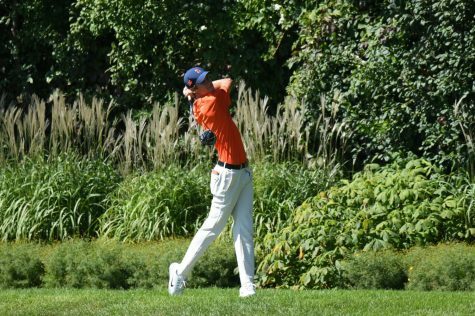 Meyer’s individual championship helped the Illini complete a first-place finish at the tournament. Illinois finished with a team score of 829, good for 11-under. Northwestern was the next closest team at 5-over. 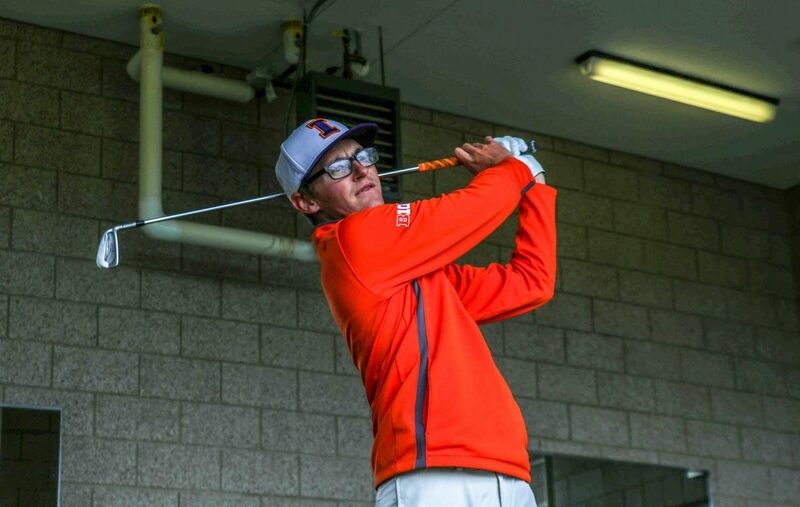 Meyer’s win was the seventh consecutive time an Illinois golfer has won the individual title at the tournament, an unprecedented feat in the Big Ten. Illinois also swept the three yearly awards the Big Ten gives out, including Mike Small being named Big Ten Men’s Golf Coach of the Year, his ninth time winning the award. 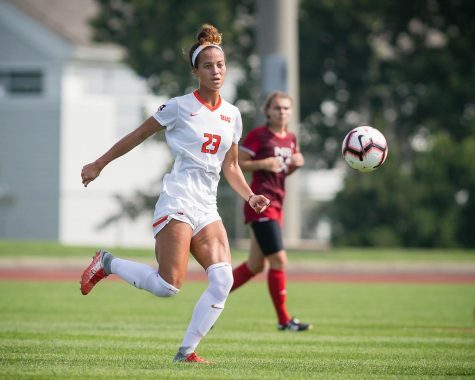 Small has led the Illini to eight conference titles in the past nine years with the only exception being Minnesota’s 2014 win. Small has had eight golfers — now including Meyer — earn player of the year titles and has coached six different players to seven individual Big Ten championships. 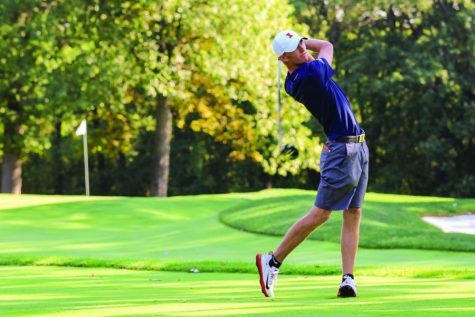 Michael Feagles garnered Big Ten Freshman of the Year honors, and Illinois has now swept the Big Ten’s yearly honors three times over the course of the program’s history. Junior Nick Hardy and sophomore Edoardo Lipparelli were each named to the All-Big Ten First Team, along with Meyer and Feagles. Hardy and Meyer were each unanimous selections to the team, and freshman Brian Baumgarten was named as one of the Big Ten’s Sportsmanship Award Nominees. Meyer and the Illini will next be in action May 15-17 for NCAA Regionals competition. The bracket will be unveiled Thursday, giving the team a sense of who and where it will be playing.